On the surface, NBC's Hannibal and ABC's Agents of SHIELD are not similar series, and do not lone themselves to comparison. But when you devote a little time to thinking about it, they share more similarities than you'd expect. Both are adaptations (or rather, expansions) of popular franchises for network television. Both feature ensemble casts, with an eye on long form storytelling. And both have, to this point, produced about the same number of episodes (Hannibal over two seasons, SHIELD over one). I thought it might be interesting (and I could be wrong on that, we'll have to see) to examine these two series, and see how it was that one was able to transform from a unnecessary retread of a tired concept into the best network drama of the last decade, and the other went from being a promising continuation of a limitless storytelling universe to being a mediocre and fairly forgettable serial. Hit the jump for the analysis, which contains spoilers for both series up to their latest episodes. As we now know, SHIELD has been built around the twist at the heart of Captain America: The Winter Soldier since it's conception. This should have put in place a strict framework for the writers to build the show around. Knowing exactly how many episodes you have to tell a particular story, in theory, should give the story telling an immediacy and a direction that is usually lacking from opened ended serial drama. A lack of development, a hesitation to redefine the narrative purpose, and an adherence to the status quo are things we see all the time in shows that have to exist on a season-by-season basis. Knowing going in that SHIELD would undergo such a massive upheaval at this point in the season should have created an environment that allowed them to tell very plot focused stories that built towards the revelation without giving it away. Instead, they lingered in a holding pattern, filling the early season with filler episodes, and suffocating their own independent story arcs by drawing them out so that they are now in direct competition with the larger MCU plot. Hannibal has, from it's inception, also been rigorously planned. Fuller has not been shy in detailing his seven year plan for the series, which will use the established novels of Red Dragon, Silence of the Lambs and Hannibal as their sources. But that the series needed to establish those character and events in an original three year build up. 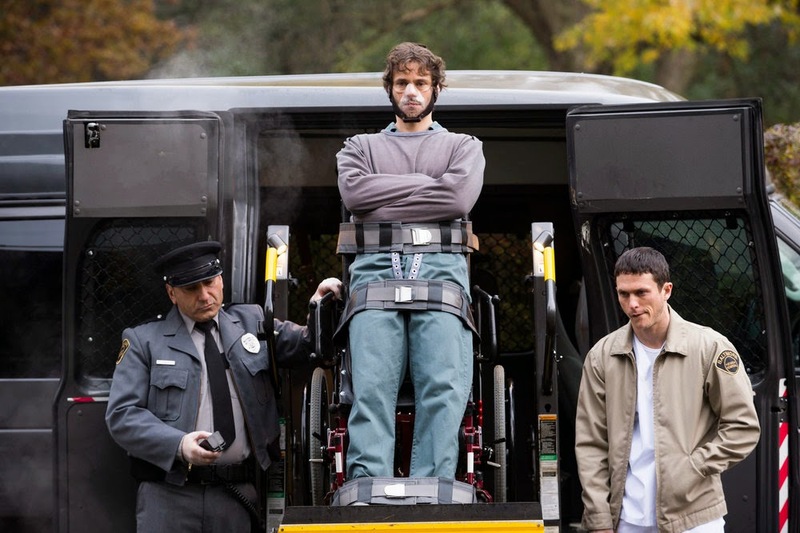 Knowing from the start that Hannibal needed to be incarcerated before the events of Red Dragon could occur has created that very narrative framework that a specific end game creates. They have been able to shape the early seasons around the notion that Hannibal will be caught, and that it is the writers job to take us to that point in an organic way. It's not as simple as creating a procedural situation, and than suddenly have Hannibal get caught. The drive to catch him becomes the dominate narrative force, constantly pushing the series in that direction like a gentle river's current. Everything in the series to this point has been put there to move us in that direction, and the writers have made certain that we haven't gotten stuck in the reeds or trapped in an eddy along the way. I will advocate the importance of characters until the day I die. Without interesting, engaging, complex characters, there is no reason to become invested in the story. SHIELD, as Joss Whedon tells it, was designed to focus on the auxiliary of the MCU. The normal folk who have to live through the effects that superheroes and aliens have on the world. But just because they aren't "special" doesn't mean they have to be uninteresting, which has been SHIELD's major problem since day one: the characters are one dimensional. The writers seem to think that having a single quirk or defining attribute is enough to coast on, and worst than that, they mistake a narrative mystery for character development. And they have committed the cardinal sin of forcing their expectations onto the audience rather than allowing the audience to create their own relationships. From the outset, Skye has been designed to be the Willow or River analogue, the geeky audience surrogate who says sarcastic things when the ridiculous happens. Except they haven't put in the work to make her engaging to the audience. We're expected to like her because she was made to be liked, not because she is likable. Her involvement in episodes hinges on the expectation that we care what happens to her, not because she has done anything to make us care. The reaction I had to her getting shot was one of... I don't want to say joy, but joy. And that feeling was felt across the increasingly small audience. It was not, I can promise you, the emotion the writers had intended us to feel. They assumed that we would feel for her the same as Coulson did: desperate for her survival. In actuality, most of us felt relief that something interesting had happened at all, and were disappointed when she survived. And now, the character is right back to where she was before she took the gut shot. At best, the characters of SHIELD are stagnant, and at worst they are inconsistent. Coulson has arguably underwent the most evolution, but most of that was off the back of what had already been established by the films, and did little to move the character in a new direction. Coulson's journey back from death has seen the character question authority, become emotionally unstable, insist on revolt and make declarations on not being beholden to anyone in the quest to discover the truth... multiple times. And it seems that after an episode has passed, he reverts to type. It has only been in Winter Soldier related episodes that characters have demonstrated any complexity of motivation or action. But none of this was alluded to, or built up towards. The reveal of Ward's treachery makes him immediately interesting, considering that he had previously been promised some development at the hands of Asgardian technology, a thread that was promptly abandoned. But the effectiveness of his treachery depends on how much we cared about him before. And he, like most of them, only ever seemed like part of the environment rather than an activate participant. May suffers from this too. Her reveal that she has been reporting to Fury, was instrumental in putting together Coulson's team, and has been acting as a fail-safe from the start might have been an interesting development - if the writers had suggested that she was more than just a wrecking ball at an earlier stage. They did the opposite, making her as bland and uninteresting and cold. That's not misdirection, that's just bad development. Characters should not be defined by quantum leaps. It isn't development if a character remains stagnant for half a season, than suddenly become something new because it serves an immediate purpose. Such artificial accelerations smack of lack of planning. Hannibal's characters, which are the driving element of the series, are not the same people they were in the premiere episode. Each of them has been transformed by their interactions with each other. While it would have been easy to make Hannibal a shallow psychopath (as one could argue the films did), instead Fuller has crafted a fathomless well from which to draw. He is manipulative, though without personal agenda. He is calculating, but sympathetic. He is passionate, and terrifying. When he acts, the viewer must question why he has chosen to act in that way. It is not as simple as "he just did." His actions have justification personal to his beliefs and his ethics, which do not fall in line with any other characters, and the writers must consider those ethics before they can direct the characters to action. Otherwise it would seem disingenuous. I noted, a few episodes ago, that while the developments of an episode were thematically interesting, they didn't ring true. This is because the writers were forcing their expectations on us. In a vacuum, a breath of air is alarming, and since Hannibal has never seemed forced, when it is, it is jarring. Will has underwent the greatest journey on the series so far, and if you compare him from the pilot to the most recent episode, there are similarities but he is a significantly different person. His actions have shaped his behaviours, and his behaviours have shaped his actions. And it happened over the course of multiple episodes. Even confining examination to the first season, the onset of his disease and the manipulations of Hannibal are present from early on. You can see changes happening in the character, in his speech, in his behaviour, in his perception. You know something is happening, you just don't know what. So, when it is revealed, you experience satisfaction rather than confusion. Declaring something to be true is radically different than revealing something to have happened, and that is something that Hannibal's writers understand, and SHIELD's writers can't seem to. That, and Hannibal's writers seem league most interested in their characters than SHIELD's writers. Both of these series draw from a deep and beloved mythology. SHIELD has both decades of comic, and a string of acclaimed films; Hannibal from a series of engaging novels and very well known films. How they have approached this influences speaks to the detail in which the shows have been crafted. From the first episodes, fans have demanded more evidence that SHIELD exists within the larger MCU. I can understand the writers wanting to establish their own identity before sharing the stage with more well known properties. But the best they seemed to be able to muster was heavy handed references to Stark and gamma rays every week. In those early episodes, it seemed like those were the only two elements of the larger MCU that the writers were aware of, to the point where it became embarrassing. And considering the deft ability for the film to sprinkle subtle easter eggs in their properties, it was disheartening. They have found better success in the second half, incorporating elements into the series with more frequency, but without the heavy-handedness. The Sif episode was wonderfully done, as was the previous episode's incorporation of a (presumably) Kree corpse being part of Coulson's "mystery." But, because they have clumped all of these elements into the back half, when they knew the Winter Soldier elements would come into play, it has very much the feel of putting all the eggs into one basket. They now run the opposite risk: reaching critical mass. In those early episode, it was critically important to make the series feel like it was part of the MCU. Iron Man did not need to show up in Thor for it to feel that Thor took place in the same world (they had Coulson for that). But when the films make their connective tissue, they never felt like they were celebrating their cleverness. In SHIELD, sometimes there would be an undercurrent of self congratulation after they made reference to the larger universe, like they were so proud that they had just mentioned their big brother. So it came off as about as organic as Pierce telling his Aretha Kitt story on Community. There is a way to be a part of the world that doesn't hinge on having Samuel L. Jackson put in a cameo every six months, and I'm still not certain they have learned that lesson yet. On Hannibal, Fuller is aware of the expectations of the audience. They know the mythology of the character of Hannibal Lecter, and there is an expectation to see those influences appear in the series. And they find organic moments to fold those in. When Will was trussed up in the iconic hockey mask and straight jacket, it wasn't fan service, it was reasonable in universe, and gave the audience a thrill. More subtly is used when incorporating whole passages from the novels into dialogue (as was recently done with Jack and Bella discussing her lasting memory), or in drawing connective tissue between actions now and what readers know will happen latter in the books (Will's attempted assassination plot, for instance). In the latest episode, Hannibal made reference to the "census taker" line of dialogue, arguably the most famous in the Lecter canon. It wasn't forced, it wasn't mocked, it wasn't pointed to and beamed at. It was stated, it worked, and it was moved on from. Fuller and the writers are also able to adapt, to make what they want to use work for their situation. Miriam Lass and Abel Gideon are the show's interpretations of the film Clarice and Lecter. At first they are homages, but they are then developed into tools for the writers to expand and further the driving narrative, by using these characters to further character development. Each hand feeds a mouth, and it all works together. In Hannibal, everything is an equal part of a cohesive net, and even if the writers add something in just for fun, they make certain that it serves a purpose. On SHIELD, elements exist independent of each other. And like continental drift, they longer they remain disconnected, the further they stray from each other until all you notice is the distance between them. 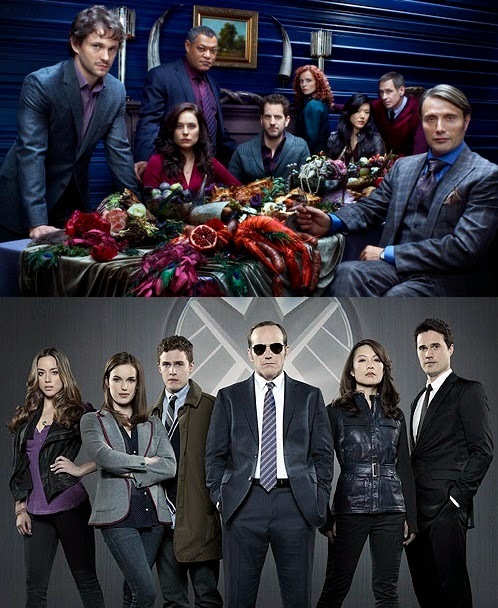 It is more than a little unfair to compare these shows. Hannibal is exceptional TV. Rarely exceptional. The people involved in putting that show together are doing their life's work. But SHIELD isn't good TV. It isn't even passable network fair. There isn't anything that makes the series memorable beyond being part of the MCU. In nearly every respect, it fails to distinguish itself. It isn't interesting in being monumental, or ground breaking, or even interesting. At no point has the question been asked by the writers or the producers as to how they could make this corner of the MCU their own, to make something that people take notice of rather than just have on for sound in the background while they surf the net. And the evidence of that is that, every week, more people turn it off, or never even turn it on. Simply existing isn't enough to make it note worthy. With Whedon's name on the door, it lives in the shadow of his prior accomplishments. Buffy redefined the way television shows were structured. Firefly showed how quickly an idea build on a foundation of passion can take hold in the public mind set. The best that SHIELD can claim is that they have shown how not to do something. And they have done that very well. I feel like I should clarify something: when they announced Hannibal, I thought it was the stupidest idea I'd heard in a while. Dig around the archives on the site, and you'll see my posts, about how I thought the first trailer looked ridiculous. Meanwhile, I was one of the loud, happy voices championing Agents of SHIELD when it was originally announced. I thought (hoped) it would be the greatest thing ever, and was incredibly excited about it. The first episodes of both series completely converted me to the opposite view, and everything that has followed has solidified my new position.